very usefull blog…Thank you so much.. The plugin mentioned in this article called: “Quick Page/Post Redirect” has recently been flagged by the WordFence Security plugin as not having been updated by the programmer. It was last updated 3 years ago. I have started using the Redirection plugin, by John Godley, that is also mentioned in the post. It’s has been working fine as a replacement. I’ve had this issue before with Elegant Themes posts… I read a super interesting article and go to check out a recommended plug in only to find the plugin is super old and no longer updated. Is it that the author is recycling a post they wrote years ago or is a plugin that hasnt been hasn’t been tested with at least the latest 3 major releases of WordPress really the best plugin possible? I think rather than make changes on .htaccess file, ts a good idea for those who are not good on programming. They can use redirection plugin on wordpress and replace old URL with new one. I love to see how something that may seem a little confusing is explained in such a clear way. Congratulations on the article. Very complete and well explained, congratulations on the article. Useful article! Simple solutions to a very important task. Hi Kevin – I have some old posts that I want to update a bit and recycle. I then want to publish them as new posts (so that my email subscribers see them as new) but I also want the old post to stay within the frame of the blog when it was originally published. Does the plug in work for this situation? I really don’t want to lose any permalink information. But i still have something to ask, since wordpress plugin causes site to load slow, i was wondering is there any way to make REDIRECT instead using wordpress plugin ? Have another read of the article, that was mentioned at the very start. If for example I wanted google to crawl a page but when an end user clicks that link is then redirected to another page. Is this possible? I have multiple pages with keywords to certain geographic areas but want all web users to end up on a generic page. Thank you very much, but what code I have to add into htaccess to redirect old posts to new posts (of the new website)? Thanks again. Thnks for this complete guideline of redirect link in WordPress based website. You sharing a informative and helpful post with us. I have a question re: the need to use a plugin for this in WordPress. I understand the use of a plugin to help automate a large number of redirects if I moved my blog to a new URL, but what about the case of needing only one or two redirects? Can I use cPanel for instance? For instance, I want to create a promo card and have a shortlink that takes people to a blog post with a long title. So i created a redirect using the cPanel tool in GoDaddy. It doesn’t seem to work though. The redirect from “mysite.com/promo” doesn’t open the page “mysite.com/blog/promotionalpage”. Any ideas if redirects with cPanel will work in WordPress? I have a blog on WordPress.Com, i want to redirect it to a difrent URL but i dont think there’s a possibility to add a plugin. Thank you for an excellent article, and some great Comments. I have a problem/question that is related. Can 301 redirects placed in the htaccess file of a new WordPress site pick up people looking for pages from an html site that has been closed down. pick up people looking for the old page, which isn’t on the new WP host? If I’m asking the wrong question, and there’s a better answer, shoot! I have used redirection plugin for my website cause I changed into pretty permalinks. After that the website was very down. I swiched again to the the default ugly permalinks but was also down. I changed again to pretty permalinks and used seo redirection plugin and checked if the redirects are working but now the website is more down than ever…goes to o visits . I am a little desperate. What mistake I did? Very happy for an answer. I have a question. I have a wordpress.com site and want to move my articles to my new website. I paid for the redirect site WordPress offers (and later cancelled) but it only redirects articles to my homepage and not to the destination to where the article was moved too. If I just delete the article on the wordpress site and leave a link to where the article is in the new location, will I get penalized by Google’s rankings for this? Thank you in advance. Hey Kevin, Just googling for the plugin and got your link with individual descriptions. Another awesome thing is, elegant themes blog comes up in most wordpress related search results on the first page. Thats a huge achievement. thanks, very interesting reading. Any advices/suggestions if I would like to redirect users from e.g. the US to one site mydomain.com/us and users from the UK to mydomain.com/uk ? Thanks! I have a theme that creates “call to action” / “featured” sections that have me select an existing page, and in the header they use the page title directly from that page, without any option to set it manually. I had no idea plugins existed that would make redirecting so easy – now I can create a “dummy” page with the title that I want in the header of the call to action section, and then have it redirect to the page that I actually want people to land on (with a different title). Thanks so much! Thank you for giving info about redirects. I never knew, it would be so easy with the plugin you mention. very useful article. Is there a way to redirect using a user id? I have a menu page that i want to use to direct logged in members to their own page that displays their own unique fitness results. I want to redirect to other plugin page so how can i do it? Very informative and detailed post. I use the ‘Redirection’ plugin for 301 redirects. It is really simple and easy to use. Great for people who don’t know how to edit the .htaccess file as well ! I’ve slightly changed slugs of my various post URLs and was looking for some suitable plugin which could accommodate this change in bulk. Thanks for such nice informative post and this great help. Hope you can help. I’m sure this is not new and mentioned many times, but I can’t seem to find an answer. My setup is having a WP Multisite Network install in the root directory. Then I installed a few more fresh WP Networks in different subdirectories just so I can keep things separate and not be using the same database. Question is, can I map domains to any of these subsites that are part of these subdirectory networks? I can’t find a plugin that can handle it and am looking to see if htacess redirects would work. This is a very informative article post and I am sure that it is very helpful for those who are not as technically challenged as I am. http://www.yourrelationshipwhisperer.com and now when I submit my site to Google I receive redirect errors. Your help is appreciated and thanks! Great article, thanks for taking time to create it. What are your thoughts on Pretty Link? Thanks, Kevin! It had always seemed so intimidating!!! 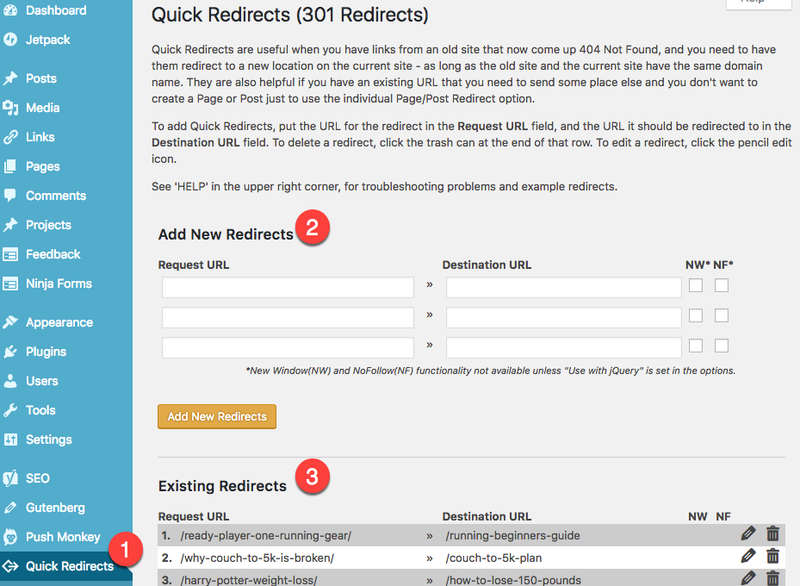 I struggled setting up a 301 redirect using .htaccess, so I downloaded the Redirection plugin. But now I’m not sure what to put into the Source and Target URLs – I’ve got over 300 blog posts, and surely I don’t have to enter each single one….? Thank you so much for the article. I understand everything except (and this is a silly question) should I change all URLs first, i.e. the site I’m working on was never changed from Default permalink types and I need them on Postname- the site has been up a while, and I don’t want to affect the SEO they have….. So should I change the permalink type first and then write the redirections in the htacces. Or should I leave the permalinks on default, with the written redirections in the htaccess file acting as the new URLs? Hello, I have a blog on wordpress.com and created another blog for a category in the previous blog. Now I want to redirect specific posts from the old blog address to the new one. All help I received previously talked about plugins, unfortunately i don’t code either. The problem is that I can’t see a plugin menu in my admin sidebar…can you help me? Can I do a redirect without codes and without plugins? Or can I get the plugin menu unto the admin bar? Thanks for the article it is very helpful and I think it is a piece of the puzzle I am trying to figure out for our library. I have created searchform.php in my theme in order to add a radio box below the search box. This radio box will allow a library patron to either search the site (using WP built in search), or search our library catalog (a hosted service on another site). I run Shining Star Photo Booth, an event entertainment company that provides photo booth rentals. I have based my site on Chameleon (http://www.shiningstarphotobooth.com) and if I type in an invalid URL, it goes to a theme page saying those results do not exist. Is this the same as a valid 404 and 301 redirect? Thanks for this great article, it’s really helpful. We are trying to integrate our blog to our website and so switch our blog from domainname.wordpress.com to domainname.com/blog. The first link has no hosting so we can’t install this pluging. Do you know how we can redirect the links from the first to the second link? You need to move away from the WordPress.com service first. Yes you can just redirect the full folder to your main website. That is what I would do. Where should all my redirects be pointed to? What should the one URL for my site be? Thanks for re-visiting this thread. There is no benefit to using www over non-www. Simply choose one and stick to it. One quick question.. I’ve been using different versions of my address all over the internet in signatures, etc. without knowing that’s a bad idea. I’m using the ‘Redirections’ plugin mentioned up top and I don’t know how to get all my URL types to go to just http://www.firstquarterfinance.com. I don’t want to hurt my pagerank. I know it’s not your plugin but am I even thinking correctly here by having this goal? My posts are created as http://firstquarterfinance……. by the way. Hostgator many times giving 500 Internal Error. I want to change the Hostgator Ad in that page. Any idea ? We are paying for them and when our blog gets traffic or sometimes they block the website and started showing their ads. I’d leave any hosting company that starting messing around with your website without your permission. Best to look for an alternative. Sage advice Kevin! When companies start messing with your websites, it’s time to leave. And thanks for the very informative article and thoughtful replies. Was just looking for some good quality reasonably priced Word Press themes and was surprised to find so much excellent how-to content on the site. Way to go! Any plugipart from 301 redirection to other web-site, to have full controll over 404 page? How to have full control over 404? How to easily customize it? Any plugin here? By the way, I think it is time to add 404-customization option for Divi 2.0, don`t you think? Your theme should have a 404 template. You should be able to modify it through the template area or through the options area. What do you have to do i’ve you deleted 3000 tags and getting 3.000 -404- error pages into google webmaster tools? I’m running in such problem. First thing to do is to look at why you are generating that many 404 error pages. Have you changed your permalink structure? Have you deleted old posts or pages? Thanks Kevin, this article couldn’t come at a better time. Trying to set up redirects at the moment. Thanks for all your posts Kevin, they are all very informative and helpful. I just wondered what you would suggest as being the best approach with regards to redirection for the following scenario. I’m looking to rebuild an older html website with a new version using wordpress. The site is hosted on a windows server with a cpanel that allows manual entry of redirects. The hosting company are not specifically wordpress orientated so I will need to set up the database and then do a manual install of wordpress, then set up the site. My question is, if I keep the same set up and rebuild the site with wordpress and manually set the redirects from the old html urls to the new wordpress urls, would this work best or alternatively I was considering moving the hosting and site to a more wordpress friendly hosting company and then doing the redirects once set up with the new hosting company. Obviously, if I move the site to a new host this involves the DNS as well. The site doesn’t have massive traffic but does ok. I feel however that traffic could be greatly improved by changing to wordpress and then working on the seo. Just not sure of the best approach to take as I dont want to trash the current traffic levels and ranking it currently has. I am just wondering what the best way is, if you have many domains and redirect those to the main domain. The reason doing such is to measure different print campaigns (using those different domains) and Google Analytics doesn’t show 301 redirects (e.g. as referral). Any idea to how see redirects in Google Analytics? Does this resolve the issue you are referring to – http://www.lanevance.com/web/web-development/tracking-301-redirects-with-google-analytics/ ? I also use a bulk redirect plugin, complement of Quick 301 Redirect plugin. Handy and timely info for me, as I’m beginning to slowly migrate my asp.net sites over to WordPress, one paragraph at a time. 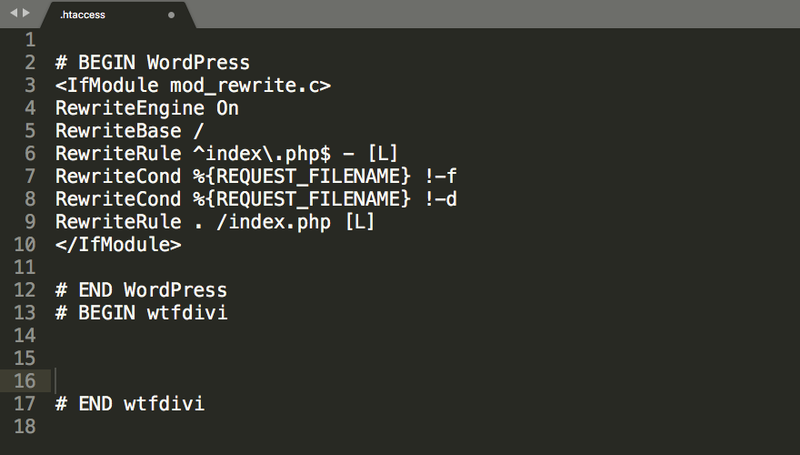 So far I’ve just edited the .htaccess file, but will check out the plugins now also. Thanks for the tutorial. I was completely unaware about the Redirect plugin. Surely I’ll try it. Hi, I don’t know if this comment will go through, I’ve been trying to comment but can not because your commenting box bounced my contribution twice. Is this selective regiment? What’s happening? I am not sure. Did you include a link in your comment? Comments with links are usually held in moderation. Another great post. Thanks a lot. Every post from you is a lesson and I jumped immediately on this one for a try. I just installed “Redirection”. It is doing what is expected and easily. I’m used to track who is on line and what url they are requiring. Few minutes after installation, I have redirected 10 old .html URL to new ones. Just great and more secure than tweeking .htaccess file. Even more funny, one of our picture is used by a site without our agreement. I have designed a special picture for it, with a message to avoid copycat. Redirection allows to send the new picture instead of the ‘stolen’ one. Waiting eagerly for your next post ! I use Redirection plugin or .htaccess directives for SEO reasons, when I have a new site moved from another platform to WordPress. To find all links, first i catch them with Xenu’s Link Sleuth, copy them in an excel file, then redirects the old ones to new ones, where they are appropriate. Good to see some other plugins, I’ll try them all. Thank you for all valuable posts. Thank you very much Kevin, I’m presently having a small issue with permalinks right now. I used custom permalinks to construct a community site I’m building but I changed to postname structure to suite a plugin and that generated 404 error page for one of my vip category page. I reverted to the custom permalinks and things return to normal but still render the hangout plugin registration pages useless, because I can’t get to the page front page when I linked to it. Maybe I will give some of the plugin you suggested a shot. Thanks, Kevin! It had always seemed so intimidating. What about the performance? Isn’t it better to use the htaccess file instead of one more plugin!? Great article. Do you know which plugins are making use of the.htaccess? Not of the top of my head. Some of them give you the option of which type of redirection to use. If a plugin does not offer that option, my guess would be that it uses htaccess; though I would not know for sure without checking. Hey Kevin! Great article! I just had a quick question. I recently moved my wife’s food blog from normalcooking.wordpress.com to normalcooking.com. Obviously, the old blog was on WordPress servers, but the new one is a custom url on my personal hosting package with Host Gator. We are trying to monetize on her blog and she gets really great traffic (about 40,000/mo). Adsense rejects us time and time again (about 4 times) and we can’t figure out why. Do you think it might be because some of her blogs are redirected from her original blog (normalcooking.wordpress.com)? Would Adsense dislike the redirects like that? Thanks! If there is a 301 redirection sending all articles to their new location, it should be ok. It’s not like you are redirecting unrelated traffic to the website. I am not sure whether traffic levels are the reason for being rejected as you have enough. Your website design looks great too, therefore I do not seeing that being an issue. I was accepted into Adsense when it was first launched, so I do not know much about why websites get rejected. What did their rejection email say? 1) “It’s important for sites displaying Google ads to offer significant value to the user. As a publisher, you must provide unique and relevant content that gives users a reason to visit your site first.” Lindsay’s site has original content on every post. Not only are the pictures original, but she types up original posts with each recipe. And obviously every post is relevant to the content that people are looking for when they come to her site. 2) “Don’t place ads on auto-generated pages or pages with little to no original content.” We don’t have any auto-generated pages or pages with little or no original content. I created each page by hand, so nothing was automatic. 3) “Your site should also provide a good user experience through clear navigation and organization. Users should be able to easily click through your pages and find the information they’re seeking.” The site obviously provides a good user experience. It’s very organized, easy to read, clear text and good use of colors. The index page and search option allow for users to navigate her site very easily, along with the tags and categories she puts on each post. The way she takes the recipes is completely legal and because she links back she isn’t doing anything wrong. I wish I could actually talk to someone within the Adsense program. That would help a lot! Sorry to get a little off topic though, I was mainly curious about the redirects and wondering if they might be the problem. I do not know for sure, but I suspect that using the exact same recipes is raising a duplicate content issue with Google. I checked a few of your articles through http://copyscape.com/ and they all highlight many other articles with the same content. I am not sure how Google handles this kind of thing. You would think that it allows text to be copied etc for the purpose of reviews. Perhaps it is the fact that all of your articles are raising duplication concerns. If one article had the same text, it may not be an issue, though if every article has the same text, it might suggest your website is simply scraping content. Again, I am only speculating at this point. I never knew plugins existed for redirects until now. This is good to know. Thanks Kevin.